Positive selection with MACS Technology minimizes unwanted effects on target cells. Positive selection means that a particular target cell type is magnetically labeled. During separation, the magnetically labeled cells are retained within the column, while unlabeled cells flow through. After a washing step, the column is removed from the magnetic field of the separator, and target cells are eluted from the column. Positive selection can be performed by direct or indirect magnetic labeling. Specific MACS MicroBeads are available for the positive selection of numerous cell types. To remove a certain cell type from a mixture of cells, the unwanted cell type is magnetically labeled. During separation, the unlabeled target cells are collected in the flow-through fraction, while the unwanted cell type is retained within the column. Optionally, the retained cells can be eluted after removal of the column from the separator (not shown). To isolate a particular target cell type in an unlabeled, i.e., untouched form, non-target cells are magnetically labeled and depleted. During separation, the unlabeled target cell type is collected in the flow-through fraction. The mixture of magnetically labeled non-target cells is retained within the column. Optionally, the magnetically labeled cells can be eluted after removal of the column from the magnetic field of the separator (not shown). MACS Cell Isolation Kits for untouched isolation contain a cocktail of titrated antibodies and MACS MicroBeads for indirect magnetic labeling. They are the preferred choice if binding of antibodies to target cells is not desired. A combination of two subsequent separations is applied to isolate cell subsets that can be distinguished from other cell types through their expression of two different markers. This includes cell types for which a specific marker has not been defined. This separation strategy is useful, if undesired cells and target cells have one marker in common. In this case, the target cells cannot be isolated in a single positive selection step using this marker. Therefore, the undesired cells expressing this marker are magnetically labeled via antigens distinct from the common marker, and depleted. The cells appearing in the flow-through fraction during this separation are subsequently labeled with MACS MicroBeads that bind to the common marker. Target cells are then isolated by positive selection. Multiparameter sorting with MACS MultiSort MicroBeads is based on two sequential positive selections according to two different markers. MACS MultiSort MicroBeads specific for the first marker allow the first positive selection. After the separation, the cells are incubated with the MultiSort Release Reagent, which enzymatically removes the MultiSort MicroBeads from the cells. 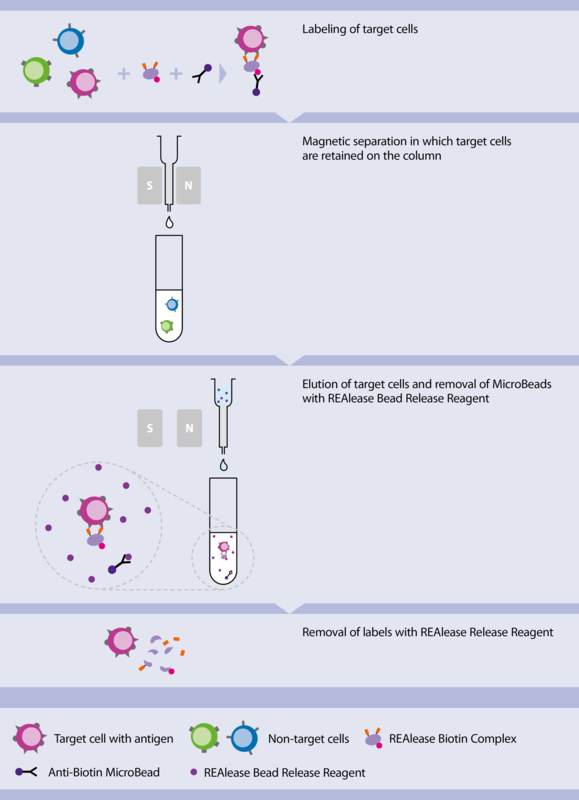 In the next step, the target cells are magnetically labeled with MACS MicroBeads directed against the second marker and again subjected to positive selection. REAlease MicroBead Kits have been developed for positive selection of target cells from PBMCs. REAlease MicroBead Technology relies on recombinantly engineered antibody fragments instead of antibodies to label specific cell surface markers. The antibody fragments have a low affinity for cell surface epitopes. However, when the fragments are multimerized as a complex, they bind epitopes on target cells with high avidity and enable effective magnetic cell separation. REAlease Technology controls the multimer / monomer state of the fragments and thus triggers the release of monomerized antibody fragments from the cell surface after isolation. Ultimately, the isolated, positively selected target cells are free from antibody fragments and magnetic labels and are thus available for further separation steps. Of course, the negative, i.e. non-labeled, cell fraction from this separation step is also available for further separation by positive selection. Direct labeling with MACS MicroBeads is the fastest way to magnetically label cells. MACS MicroBeads specifically bind to antigens on the cell surface, requiring only one incubation step and a minimal number of washing steps, therefore minimizing cell loss. Highly specific cell separation reagents for direct labeling of numerous cell types with MACS MicroBeads are available for human, mouse, rat, and non-human primate cells. Indirect magnetic labeling is based on a two-step procedure. During the first step, cells are labeled with a primary antibody directed against a cell surface marker of choice. In a second step, the cells are magnetically labeled with MACS MicroBeads, which either bind to the primary antibody or to a molecule that is conjugated to the primary antibody. The primary antibody can either be unconjugated, biotinylated, or fluorochrome-conjugated. Accordingly, magnetic labeling is achieved with Anti-Immunoglobulin MicroBeads, Anti-Biotin MicroBeads, or Anti-Fluorochrome MicroBeads. Indirect labeling can also be performed by using a cocktail of primary antibodies to concurrently label a number of unwanted cell types, for example, for the untouched isolation of target cells.